The romaine coming from the farm has been so seductive; creamy white with light green tips, crisp and succulent. I’ve enjoyed the whole leaves as a crisp counter point to rich and spicy flavors, like these meatballs with an Asian splash. Heat oven to 400 degrees. Mix together the ground chicken, egg, breadcrumbs, onion, half of the garlic and half of the hoisin sauce in a bowl, season with salt and pepper, and mix to combine. Roll mixture, about 2 tablespoons, into balls, and place on a baking sheet. Bake in oven for about 5 minutes, until meatballs start to become slightly firm. Meanwhile, mix together the remaining hoisen, garlic and ginger.Remove meatballs from the oven, and using a pastry brush, lightly brush the sauce on the partially cooked meatballs. Return to oven and continue to bake for another 5 minutes, or until meatballs are very firm to the touch and cooked through. 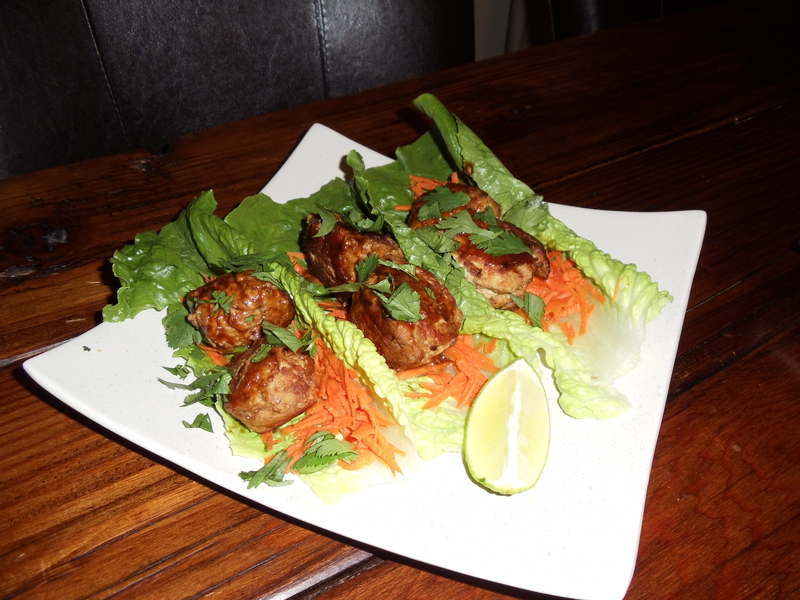 Place meatballs on romaine leaves, top with grated carrots and cilantro, and enjoy right away.